Italian boffins claim to have devised a method of predicting future crime trends in London using creepy footfall data collected by a mobile phone provider. A team at the University of Trento said they are able to work out whether an area will have a low or high crime rate with an accuracy of 70 per cent. The researchers' Minority Report style techniques used information collected by Telefonica Digital's Smartsteps database, which collects together supposedly anonymised and aggregated mobile network data, allowing researchers to spot footfall trends by time, gender, and age. 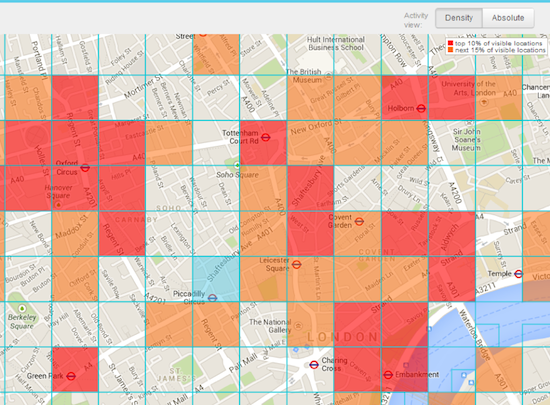 This dataset divides the capital into 124,119 cells, allowing analysts to see the footfall in a given region at various times of the day. The team also chomped public data from the London Borough Profiles Dataset, including information on the housing market, political affiliation, transportation, homelessness and life expectancy, and gathered information about individual crimes from the London Criminal Cases database. This repository of bad behaviour provides details of the type of crime committed, although it only gives the month and year of the incident, rather than the exact time and date. It was this combination of data collected over a long period with the day-to-day information from Smartsteps that was key to the experiment's success. "Usage of human behavioral data (at a daily and monthly scale) significantly improves prediction accuracy when compared to using rich statistical data about a borough's population (households census, demographics, migrant population, ethnicity, language, employment,etc...)," the researchers wrote. "The borough profiles data provides a fairly detailed view of the nature and living conditions of a particular area in a city, yet it is expensive and effort-consuming to collect. Hence, this type of data is typically updated with low frequency (e.g. every few years). "Human behavioral data derived from mobile network activity and demographics, though less comprehensive than borough profiles, provides signicantly finer temporal and spatial resolution." Each smartstep cell was linked with the corresponding data, to provide an at-a-glance summary of an area's socio-political status and how many crimes were reported there. The boffins then looked for correlations and used various statistical methods to assess whether an area would have high or low levels of crimes in the next month. They claimed to be right about this about 70 per cent of the time. The team wrote: "We have outlined and tested a multimodal approach to automatically predict with almost 70% accuracy whether a given geographical area will have high or low crime levels in the next month." They mapped their predictions in the following manner, with red standing for high crime. "The proposed approach could have clear practical implications by informing police departments and city governments on how and where to invest their efforts and on how to react to criminal events with quicker response times," the Italian boffins concluded.